Will Consumer Health Equal Black Friday Wealth? With the holidays just around the corner, the health of the US consumer is of major importance to many businesses. 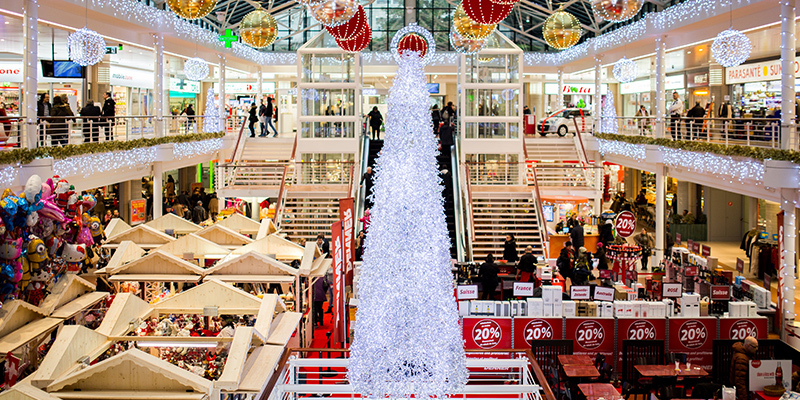 About 30% of retail sales occur in the few weeks between Black Friday and Christmas, making the entire holiday season critical for the bottom line. When we last checked in on the US consumer in June 2016, we highlighted some secular factors that could act as a drag on consumption, as well as cyclical forces that could help boost growth. Since then, economic growth has picked up, unemployment has gone down, and the media narrative around consumption has become dramatically different. Let’s look beyond the headlines to learn more about this important group. Nine years into the economic expansion, many Americans are feeling better than they have in a long time. 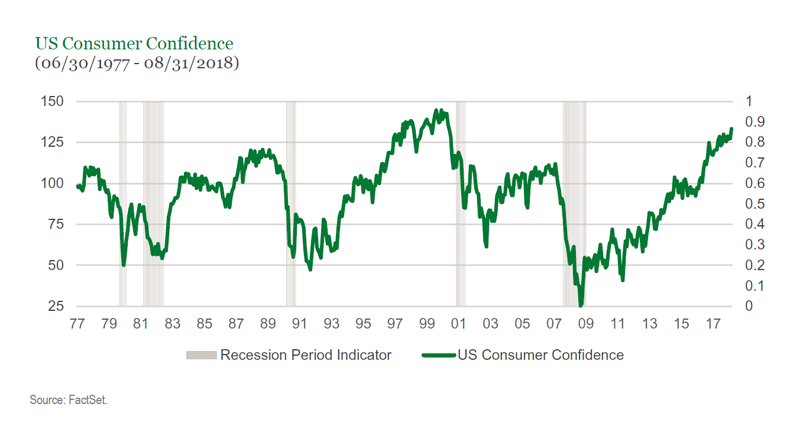 US consumer confidence is near all-time highs, and there are many reasons for optimism – low unemployment, (slowly) growing wages, and a great stock market run since the pits of 2008-09. High measures of consumer confidence like what we’re seeing today tends to come later in an economic cycle. For example, consumer debt has surpassed pre-Global Financial Crisis levels, another sign of a comfortable consumer. High confidence coupled with subdued growth is a sell signal, and today’s strong sentiment has “set the table” for this possibility. We are watching indicators closely for additional signs of stress. The health of the labor market is encouraging. The unemployment rate is at a multi-decade lows, and alternative measures of unemployment are strong too. Recent reports on wages have painted a positive picture as well, boosted by jobs growth that is exceeding expectations. 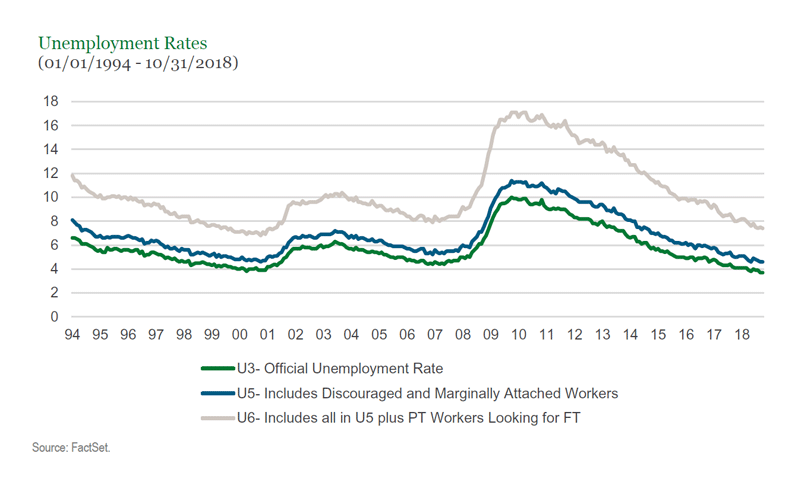 The officially recognized rate of unemployment that’s often cited in the media leaves out underemployed or “discouraged” workers – i.e., individuals who have given up looking for work but would still be willing to take a job. The U.S. Bureau of Labor and Statistics provides multiple unemployment numbers, and we watch all of them to be sure we are not missing any hidden slack. The stock market has made an epic recovery since the global financial crisis, up some 60% since the crisis began in 2007. Only 54% of Americans actually own stocks whether through a retirement account, equity mutual fund, or individual stocks. Moreover, the wealthiest Americans possess more than 80% of the aggregate value of stocks. For all the talk about the recovery, the real net worth of the median household is still about 20% lower than it was in early 2007. S&P 500 Price Return adjusted for inflation. Source: Robert J. Shiller, Yale University. We expect the relative health of the consumer will lead to solid Black Friday results, but there is more to the story than it seems. We remain attuned to pockets of weakness, and are monitoring all relevant data to capitalize on opportunities and/or avoid risks the rest of the market may be missing.